But I want to participate with this one too. Is it okay? Think idea for creepy one still hard and you know I really dislike all about 'horror-thriller-and something like that'. Cause of that I got idea, "Why not to add the pumpkin icon since Halloween identical with that" After that I'm going for browsing again and found this girl even I found her in small resolution (not really small, about 800px). Originally, the dress is white with sephia color but I change it with black cause it cool to me XD. The wall and floor came from Togainu no Chi doujin, and the pumpkins came from Adumi Tohru's artbook. That makes me open my eyes very wide when vectoring part cause I do it manually with reset brush! this is just beautiful :D well done haya-chan! I love the character especially her hair. For the bg, I like the pumkin and the tree behind the window! i like this a lot, really nice work. i love her scruffy hair and the evil wings, she's really cool looking. and im a big fan of halloween style anime art. She looks wonderful. She's very pretty, so I don't find her scary at all. I love the combination of colours: red and black. The details are great: the white branches, the petals. oh! i like you wallie a lot! 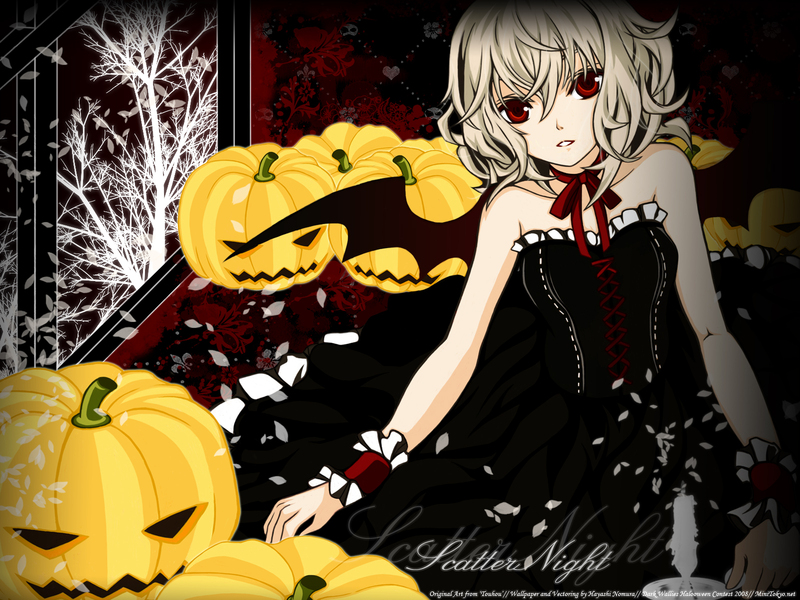 i love the chara and the pumpkins! they look really great...but i think this on is not so creepy....but anyways great! Unforunately, the point of the contest was specifically to make scary wallpapers since every year there's been almost nothing but "cute girls in costumes" for Halloween. The aim was for people to try to make a scary wallpaper. this is a very gorgeous vector! i think much better than your last one XD. the only thing i can find wrong is that those whiet trees are a bit jagged. blur it in several layers to get rid of the jaggedness, esp since the rest of the wall has been blurred. and I like your pumpkin. Sugoooooiii....! I like this! Good job, hayashinomura-chan. Your vector is just plain lovely. A big plus for the awesome looking pumpkin too. Pumpkins! I also adore Adumi Tohru`s work so yay for you for vectoring it. It`s true that this isn`t creepy but it still is pretty. The vector are flawless and highly detailed,and the background complement it with perfect synch.Yup it's not creepy,but it's lovely and cute.I love the girl's eyes most,red and sharp. WOW^^looks REALLY AWSOME^^LOVE IT^___^thanks for the share! Also goes to FAV^^it is a REALLY GREAT WORK (in my opinion), you did a really GREAT WORK^^! It's a very nice wallpaper! I love her red eyes! So beautiful! You know what, the first thing i thought while seeing your wallpaper was Halloween. The candle on the side is pretty subtle, but is it me or the leaves come from the candle, almost if the flames were actually those white leaves. Well, what enhences the mood/darkness is the negative effect you did to the trees. I dont think i would want a white sky with black trees. And by respecting the theme, you also added PUMPKINS and bat wings! I love how real they look like. One thing i would like to say is that her dress, i love how gothic it is, but the laces, the bright red onlike makes us concentrate on it rather than the whole X like design. I had to zoom in to see them clearly. Other than that the rest is all halloween! Especially her red eyes that screams vampire to me. Wow, this wall is cool!